I’m going to be writing mostly about Hunan Province and its capital, the city of Changsha. 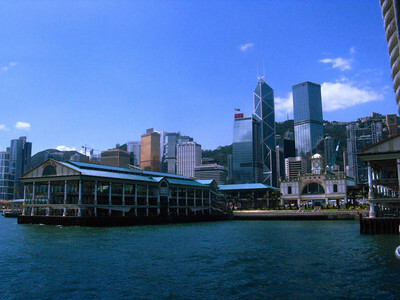 But, on the way to Hunan, I was lucky enough to spend 48 hours in Hong Kong. I’m not going to focus on that other than this one page. First, lots more Westerners have already been to Hong Kong, so there’s less useful ground for me to cover. 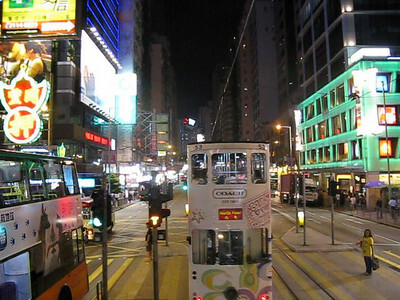 And, in its essence, Hong Kong is a Western city. Anyone in the service industry speaks enough English to help you get by. Road signs and store facades are either in English or are bilingual. And Western tourism is a major industry, so no one is going to let you leave money in your pockets just because of a language issue. For what it’s worth: the August weather is just as hot and humid, Hong Kong is less handicapped-hostile than Changsha, and the air is infinitely cleaner. For what it’s worth, I loved Hong Kong. I could actually see myself living there — although I might have to Botox my sweat glands! How’s this for globalization? Sitting in Atlanta, I posted a note on Twitter about going to Hong Kong. A friend in Bangkok read it, and introduced me to his friend Mary-Jane who’s a German-Montenegran expat, born in India, working for Oxford University Press out of London but stationed in Hong Kong! She and her husband adopted me for the weekend and took me to a housewarming party at their friends’ house… where I counted people from England, Germany, France, Spain, Sweden, India, Singapore, Thailand, the Philippines, the U.S., and one native Hong Konger. Poor little monolingual me felt quite outclassed. But the attitude everywhere in Hong Kong was upbeat, cheerful, and apparently completely unaffected by the Chinese takeover from the British in 1997. I do have to tell one anecdote… we were walking through “Times Square” (really, that’s its name!) late on a Friday night, and it was thronged with happy people spending money and having fun. I mentioned that I felt safer in this Times Square than I would in the New York version. Mary-Jane just laughed and said “Hong Kong is one of the safest cities in the world. We don’t have any disorganized crime.” Turns out that the Chinese triads control all the organized crime, and they don’t like competition… so petty crimes like burglaries and street muggings don’t exist. She claims they don’t lock their house on the southern part of the island, and she feels safe walking anywhere in the middle of the night. Probably an exaggeration, but I did feel safe. It reminds me a bit of the Thieves’ Guild in Terry Pratchett’s Discworld books.